WILMINGTON — A local resident — a husband and father — has been missing since he was last seen at the Hilton Easton Town Center in Columbus on Feb. 24. Tyler Davis is described as 29 years old, 5 feet, 10 inches tall and 170 pounds. He has short brown hair and a large birthmark on his upper arm and chest. He and his wife, Brittany Davis, were in Columbus to celebrate her birthday. He went for a walk outside their hotel around 3 a.m. and he didn’t return. 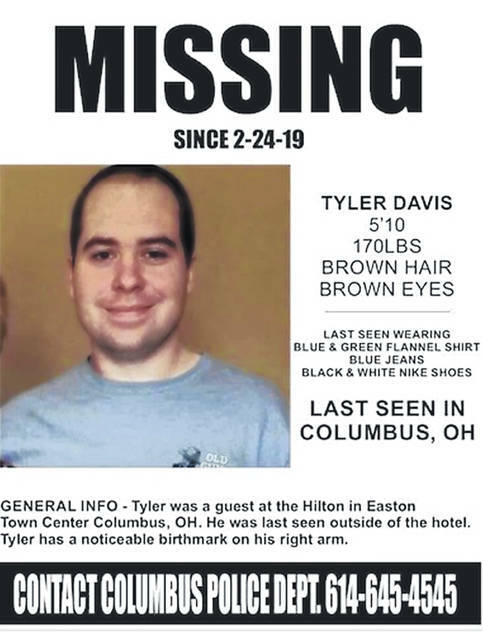 Tyler’s family and friends have been disseminating flyers and seeking information on social media and on Columbus area media outlets. Anyone with information is asked to contact Columbus police at 614-645-4545.